A while back I ordered some pigment samples from The She Space. I haven't really gotten a chance to use them much, but I have used them enough to form an initial opinion. While the color selection is great and the price can't be beat, there are a few things I really don't like about these samples. I really don't like that they come in plastic bags. I know that this is an easy and economical way to try lots of colors, but I just can't get used to it. It's difficult to get the pigment onto your brush when you have to stick it in a bag. It gets all over the side of the brush and basically just makes a big mess. It's so much easier to use samples that are in jars- like Fyrinnae and Everyday Minerals. I'd be willing to pay a little more to get them in jars. The other thing I wasn't thrilled with was the pigmentation. They look very vibrant in the bags, but when you apply them they become washed out (as you will see in the picture below). The colors I chose were all very shimmery, which I love, but only the shimmer seemed to stick to my skin as the colors disappeared. Also, the colors appear very different in real life than they do on the website. This is generally the case with all cosmetic companies, but I was still surprised. The samples in bags, Make Believe, Elves Rule, Lack Of Sanity and Glossy Moon. The samples on my skin, same order as above, applied heavily over a layer of Too Faced Shadow Insurance. You can see how they are washed out and the shimmer is really the most noticeable aspect of the pigment. This becomes a big problem when it comes to blending- they blend into nothing. I'm sure that if I really sat down and worked with these that I could make them work, but I haven't had a chance to do that yet. I haven't tried all the colors, either, so this may just be a problem with the particular colors I used. Despite my seemingly negative review of these, I would be willing to try them again. I don't think they are a bad product at all, in fact I think they would work well for most people. It's very inexpensive to try a ton of colors to see what works for you. I really like all the colors I ordered, so maybe I'm just doing something wrong. I'll use the rest of the samples that I ordered and give another review. In the meantime, samples from The She Space are only fifty cents and come in tons of colors. They can be purchased from The She Space's Website. I have never odered from The She Space since all the rewievs I read sounded just like yours. Bad pigmentation, terrible blending capacity. Still, I have also heard it is very different quality from color to color. Price is fantastic, but for now I stick to my old and known mineral makeup brands. The color selection and price drew me in. Maybe it's just the colors I ordered, but in my mind I compare every pigment to MAC pigments. Nothing quite gives me the same MAC quality, so I usually end up disappointed. I bet those pigments would be great in nail polish...give it a try if they continue to fail! Laura, that is an excellent idea! I might just try that, thanks! I'm gonna check out MAD Minerals. I just found out about a place called Pure Luxe too. They are designed to be used with a mixing medium, the fact that you're not using one is the reason they look so sheer. Anonymous, I have used them with a mixing medium since I got them and I'm still not satisfied. :( Too sheer. And I shouldn't *have* to use them with a mixing medium just to get them to show up. I'm not a fan of extra steps just to be able to use a product. I agree with most of you. The pigments do wash out. They look bright and fun in the bags, but they do not last, they clump if you try to foil it. The pigments do not blend what so ever. If you are ordering regular pigments or samples they come in messy baggies or these little jars that aren't all the way filled or they are spilling out due to shipping. Plus the one order I did place came 4 weeks after I ordered it. I hear she has a store in the Chicago-land area, but I still wouldn't waste my time. It just seems very unprofessional and sure it is cheap, but I guess the cheaper the products the less quality. I've been tempted to go back, but I'd rather spend more money on better quality stuff! 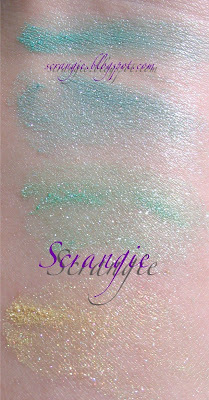 I love the She Space pigments but you definately have to apply them wet or over a cream base rather than TFSI or UDPP. I have ordered a lot of colours from Heather and have had custom colous created to give as gifts and stuff, but none of them have been pastel shades. Essie Fall Collection 2008 - Six rich colors! More Rescue Beauty Lounge Swatches!